White Fang's final owner. He rescues White Fang from the bulldog's lethal grip and from Beauty Smith's abusive care. Scott wins White Fang's trust and takes him to the Southland, where he trains White Fang to respect the laws of man and civilization. An ugly, cruel, and mean-spirited cook, Beauty uses alcohol to con Gray Beaver into selling White Fang. Beauty trains White Fang to be a ferocious fighting dog. White Fang considers him to be a "mad god." An impulsive and ill-tempered musher, he works with his sled partner, Henry, to convey the remains of Lord Alfred to McGurry. He is disturbed by the gradual disappearance of his dogs. The wolf pack attacks and devours him when he attempts to assault them with his gun. Bill's sledding partner. He is skeptical of Bill's theory that a wolf lurks among the sled dogs, but takes the disappearance of each dog in stride. Less impulsive than his partner, he manages to escape the wolf pack's attack, but leaves the incident deeply shaken. The Scott family's sheep dog. She distrusts White Fang, at first, but gains confidence in him, as he becomes a tame and protective guard dog. She becomes his mate and gives birth to White Fang's first litter of pups. White Fang's father. A fierce and experienced gray wolf, he cunningly gains the affections of Kiche, with whom he mates and fathers a litter of pups. White Fang's rival. As the leader of the pups at the Indian camp, Lip-lip terrorizes and bullies White Fang, making him an outcast among the other dogs. Later in the novel, weakened by famine, he's killed by White Fang when they encounter each other in the wild. A squat and slow creature, he is actually White Fang's most lethal adversary in the fighting ring. He nearly kills White Fang when he bites him at his throat and refuses to let go. A ferocious and vengeful feline who kills One Eye and attacks Kiche and White Fang in their cave. Scott's musher. When Scott is away, Matt feeds and takes care of White Fang. Weedon Scott's father. He doubts whether White Fang can become a tame dog, but gains faith in him after White Fang saves his life from Jim Hall. A criminal, who escapes from prison to exact vengeance on the man who sentenced him to jail, Judge Scott. White Fang attacks him, saving Judge Scott from Hall's evil scheme. Gray Beaver's son and a sled runner, who favors Lip-lip over White Fang. A sled dog lured into the wild by the she-wolf, Kiche. Called to White Fang's aide after he attacks Jim Hall, but concludes that White Fang's odds for survival are low. The strongest sled dog on Bill and Henry's team, Frog is the second dog eaten by the wolf pack. The first sled dog on Bill and Henry's team eaten by the wild wolf pack. The third sled dog eaten by the wolf pack. One of the she-wolf's suitors. One Eye kills him. Another one of the she she-wolf's suitors. One Eye kills him. An old dog who attempts to intimidate White Fang into giving up his meat. The dog that White Fang kills when he is first taken into Scott's care. One of Scott's hound dogs in Sierra Vista. The man whose remains are conveyed in the oblong box that Bill and Henry's sled dog team carries. Campodonico, Christina. "White Fang Characters." LitCharts. LitCharts LLC, 15 Dec 2013. Web. 19 Apr 2019. Campodonico, Christina. "White Fang Characters." LitCharts LLC, December 15, 2013. 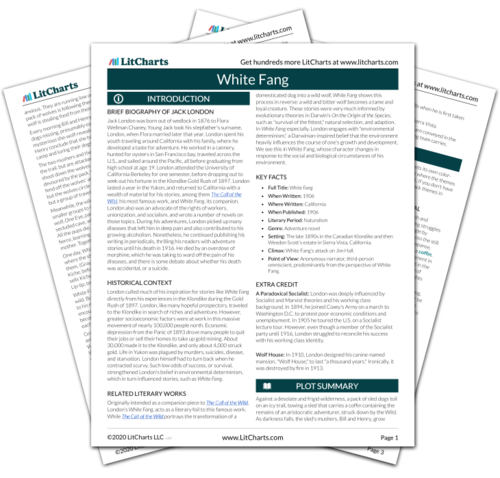 Retrieved April 19, 2019. https://www.litcharts.com/lit/white-fang/characters.